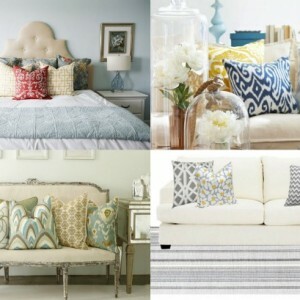 It’s time for part 2 in our How to Decorate Together series! 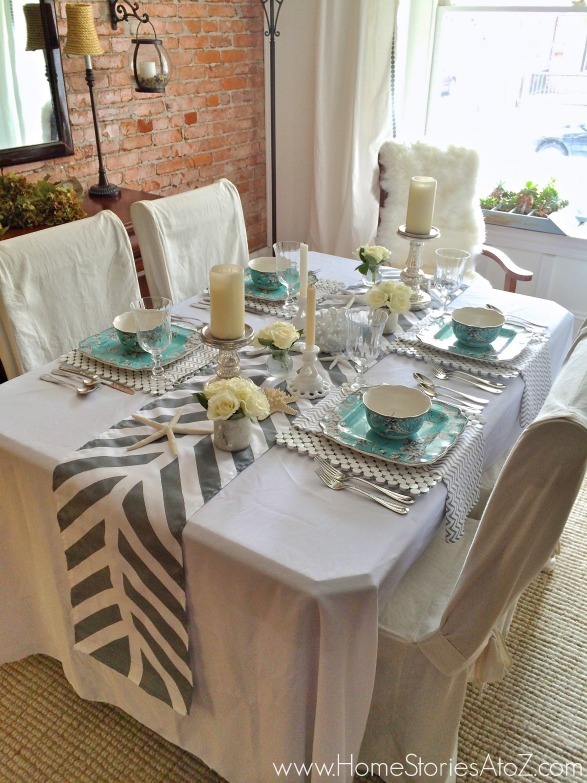 If you missed part 1, be sure to click here to read How to Overcome Decorating Differences. I really didn’t think he’d care. We had been engaged for over a year, had dated for four years, and were friends for seven years. I knew him very well at this point in our relationship. He shopped for clothes exclusively at thrift stores by choice, and his decorating style could be described as eclectic bohemian at best. He really didn’t have much interest in style or in decorating, but he was going to be my husband in just a few short months! And I desperately wanted him to be a part of our first major decorating decision together–picking out an everyday china pattern. 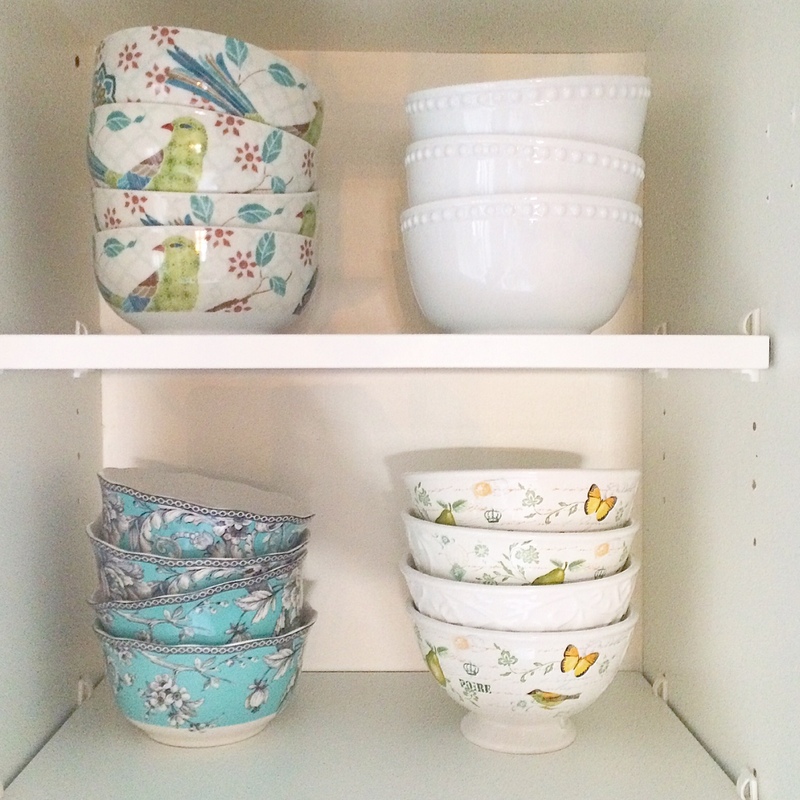 After visiting the dinnerware section of several department stores, I realized that I had made a huge mistake. Who was this man with the incredibly strong decor opinions??? Who did he think he was to veto every dish I fell in love with? Why did he think he knew anything about decorating? How in the world were we going to make our marriage work when we couldn’t even agree on our everyday dish pattern? Making decorating decisions with your spouse can feel downright threatening to your relationship when those decisions do not come easily, but do not be disheartened! 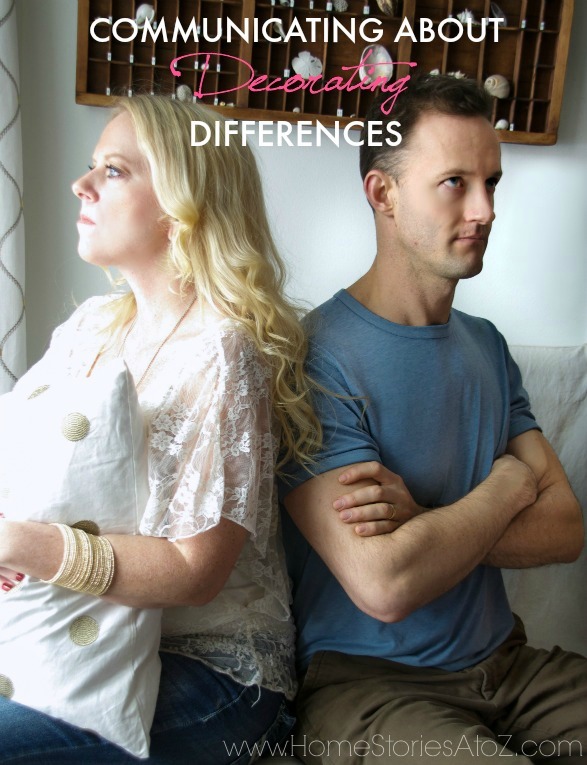 Disagreeing with your spouse over decor is completely normal and does not mean that you are poorly matched. On the contrary, it simply means that you are a human couple. 😉 So how do you move past the disagreement phase and find common ground? How do you build a home together that you both love? It all starts with how you communicate! 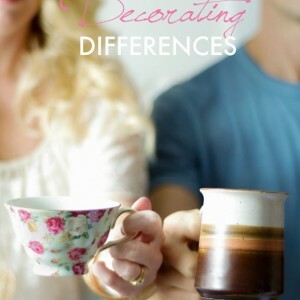 Let’s explore some helpful tips on communicating with your spouse about decorating differences. 1. On small decorating decisions, don’t ask for an opinion unless you really want one. I hadn’t realized this at the time, but Matt could’ve cared less about our everyday dish pattern. He admitted years later that he would have been fine with whatever choice I had made. But since I had asked for his opinion and insisted he see every dish pattern available on the planet during that time, his time and energy were then invested which bred a strong opinion. While it is of course important to consult your spouse on the big decor decisions, you might be better off not asking for an opinion on the minor ones–unless you are ready to handle a contrary one! I realized that what I really wanted from Matt was simply someone to confirm my own opinion. I wanted him to act like a girlfriend and be excited about dishes! I didn’t want a pragmatic, practical approach to dish shopping. And I definitely didn’t want his color and style opinions. I wanted him to see what I loved and help me narrow down which dish most said “us”…er well to be honest, “us” with a heavy emphasis on “me”. Now after 15 years of marriage, I know better than to ask for Matt’s opinion unless I really want it. Sometimes I will simply say to him, “Babe, I need you to be my girlfriend for a minute and tell me which ______ you think I like best.” He understands this type of opinion-giving and knows exactly what I’m asking for here. Be clear with what you are asking your man, and remember that he more than likely does not hold a strong opinion on small decor items. Don’t ask for involvement unless you really want it! Let’s pretend that you spent a little time blog hopping on your lunch break and have decided that you must have a white subway-tile backsplash in your life. It is more than a want…it is a need. You aren’t particularly handy but believe that your husband is capable of creating this dreamy white subway-tile backsplash for you. When he walks through the door that evening, you call him over, show him the blog post tutorial and ask him to create one for you. What do you think his response will be? My guess is that you are most likely going to get an annoyed and resounding, no. But why? Why can’t he see that this will make your home look amazing? Why isn’t he immediately on board? Why is he shooting down your dreams? Well, for a few reasons. The first–and most important reason–is your timing. Walking through the door after work is usually a stressful time in most households. Everyone is typically tired, hungry, needy, and not in the best frame of mind to hear requests for additions to the “to do” list. It is better to choose a time when the pets and kids aren’t demanding attention and everyone has eaten and had a chance to unwind from their respective workdays. For most couples, the evenings after the kids have gone to bed work best for these types of discussions. Finding the right time to discuss your desires isn’t about manipulating your partner into doing what you want. It’s about being sensitive to their needs, before your own, and picking the best time to discuss your request. 3. Learn to do it yourself. 4. Remind him of your passions. Nesting is as important to my well-being and happiness as sunshine! I decorate and create from a soul-level passion and feel that I was made to create and inspire others to do the same. Creating beauty out of chaos is how I express my love for others, how I show hospitality, and how I nurture my family. Perhaps decorating doesn’t rank on a scale of “soul level” for you, but I’m guessing that if you’re reading this post then creating a home you adore is a high priority for you. Perhaps it seems silly and sexist in our modern world, but most of us spent our childhoods playing “house” and dreaming about creating our future homes. Decorating is something that has mattered to us since we were little girls. 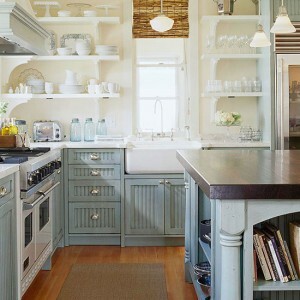 Creating a home you love is not just a frivolous and pointless activity. It is how we tell our story, and how we set the literal stage and backdrop for our lives. Decorating holds value and is worthy of our time and investment. More than likely your guy loves you and values what is important to you. He wants to see you happy! Remind your man that decorating is important and remind him exactly why it is important. 5. Show gratitude and a willingness to collaborate and compromise. Matt helps me with select projects because he knows how much I value his help. However, I also know that when I ask for his help on a project I have to be willing to collaborate and compromise. If he is working on a project with me, I know that the project will quickly become ours and is no longer mine. That might sound like a rather obvious statement, but it’s not always easy to remember! Chances are good that your spouse has strong opinions on how to tackle a project and his brain may work in a completely different manner than your own. Show that you are grateful for the help and be willing to allow him to do it his way. If you are the expert in a certain DIY skill, try saying, “I’d love to show you what works best for me,” and demonstrate how you do it. Be willing to make compromises and take into consideration his needs and opinions. You might just be amazed at the beauty the two of you are able to create together! 1. Don’t ask for an opinion unless you really want one. 2. Your timing in discussing your decorating wishes is everything. 4. Remind him why decorating is important to you. If you found this post helpful, please pin it and share it with others! Next week, I’ll be tackling what to do when the two of you hold very strong decorating opinions. 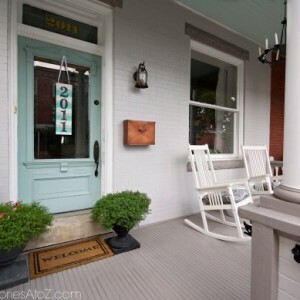 We will look at ways to blend two decor styles into one. In the meantime, you might also enjoy the related posts below. My grandma was an interior designer and loved to decorate her house while my grandpa hated to spend money on anything. She would wait until he went out of town on a business trip to do any renovations. When he came home, he’d find the kitchen had different cabinets, or there was a wall missing, or a whole other room had been added on. I told my fiance these stories and he made it a rule not to decorate without his input. By decorate, he means things like painting the walls, changing tiles, anything that would take more than an hour to do. Problem is, he doesn’t want to spend the money on any of it, and won’t even discuss options. I’ve even offered to do it myself. It’s so hard when your man sets a boundary that feels unreasonable and unnecessary! My best advice is to gather inspiration so that he can see your vision, gather all of the details on exact cost of the project, and approach him with it during the best time possible. Often our battles in love and marriage are attached to larger core “heart issues”. As cliche’ and trite as it may seem, men often feel the ultimate need for respect and women for love. If you move forward on a project without his input, he could interpret it as disrespect and therefore unloving. Acknowledge this and his anxiety over being disrespected in marriage will significantly subside. Expressing your heart’s desire at a time when emotions are level and you feel safe being vulnerable (i.e. NOT when you’re already arguing), I’d recommend explaining how the extreme limits on your decorating options makes you feel. Marriage is a constant dance and is so rewarding but does take compromise and work. You’ll benefit from doing that hard work now before the wedding! Congrats on your upcoming big day and blessings on your new home! I agree that nesting can be a really valuable hobby. Not everyone feels that way, but your partner should be on board if tell them how valuable it is to you. I know my grandma finds a lot of value in finding new places to buy decor to update her look every couple weeks. I recently found your website and really like what I’ve read so far. Good advice and great topic! How do you communicate about the bigger decorating decisions that are not DIY, though? The ones that require the time and financial investment of both parties such as painting the walls or a new piece of large furniture such as a dinner table or sofa? Should I then ask “which of these 2-3 do you like most?” when I have narrowed down what I like most? Hi Julie, thanks for stopping by my blog! I’m so sorry for the delayed response to your questions. Your comment was temporarily lost in my comment feed, and I just discovered it today. You pose really great questions! When it comes to painting the walls, I do all of the work myself and at this point in our relationship my husband trusts my judgment on color selection. I always show him my plan before purchasing paint and discuss the vision for the room. (The only time he questioned my plan was when I painted my office/craft room pink. 🙂 And honestly, he was right. The pink just isn’t really “me”, and I will be repainting it soon.) When it comes to large financial purchases, yes, I think narrowing down the options to 2 or three that fit your needs, budget, and combined style is a great way to go. 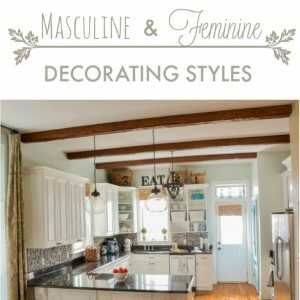 Problems arise in relationships when either party feels disrespected and disregarded, so it’s important to know your man and know how much he wants to be included in decorating decisions. Most men (certainly not all) simply want to know that their spouse is going to respect the budget and choose options that reflect the couple/family rather than just the wife’s preferences. i just found ur blog today!! :)) and this post won me head over heels in love with your blog! weird na but thats the truth! ohh my god u just took every word from word from my heart and mind and put it out here in this post. iam your fan now!! Awesome! I find that I don’t ask if I don’t really want to know on not just the small things but some of the bigger things too 😛 I really do care what he thinks sometimes but sometimes I wish he would just agree and validate my choice. Thanks for this fun series! “Let’s pretend that you spent a little time blog hopping on your lunch break and have decided that you must have a white subway-tile backsplash in your life. “- Bahahaha! Great post, this is totally making me think back to so many conversations with my husband over the years. He could care less how I decorate, but when I ask his opinion, I had better be ready for the full opinion! Very rarely does he make a complaint or say something is really not working for him, so I try to be sensitive at those times. Otherwise, “The man is the head, but the woman is the neck…and she can turn the head any way she wants it to go!” (name that movie). Terrific post, Beth. I’ll tweet its link. Ha! That’s one way to table the conversation. 🙂 Thanks for visiting me Barbara and for the tweet! Absolutely love this! Thank you for the advice, definitely needed this at this point in our life. Married 15 years as well, and at a major stand still in a “decorating” house decision. Glad you found it helpful Stacy. Good luck on your next decorating decision! Great advice! I love this series!